Hi. I recently planted a couple of herbs and thyme was the first one to germinate. But after growing to a height of 1 inch plantlets, there is not much growth. I usually keep it outdoors if it's sunny and indoors if it's raining outside. Please advice. Attached pictures of parsley which started germinating very late but has grown really well, and picture of thyme which shows very few plantlets. 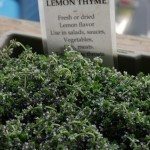 When starting Thyme from seed, it can be a slow start!